Download and post the seminar flier. Many advances in the understanding and design of nanomaterials have been enabled by spectroscopic methods of increasing spatial and temporal resolution.In electrochemistry, spectroscopy has delivered insight into the processes involved in harvesting, converting, and storing energy. In support to experiment, much progress has been achieved in the simulation of spectroscopic phenomena to shed light into energy conversion at the molecular scale. This understanding is critical to the nanoengineering of electrochemical cells, batteries, dye-sensitized solar cells and water-splitting photosystems. This talk will highlight the predictive performance of novel quantum and multiscale computational approaches in describing spectroscopic experiments in the infrared to ultraviolet range. This remarkable performance fosters dialogue between experiment and theory to interpret complex spectroscopic data. The first study presented addresses the infrared sum-frequency-generation (SFG) spectroscopy of the chemical mechanisms at the origin of the tolerance of fuel‐cell electrodes to poisoning. The influence of the electrode voltage on adsorbed species in analyzing infrared electrochemical experiments will be explained. A second example studies the photoluminescence (PL) of heavy‐metal dyes to clarify the role of ligand functionalization on the phosphorescence and sensitizing properties of these charge‐transfer complexes. A third example focuses on the simulation of ultraviolet photoelectron spectroscopy (UPS) experiments to probe donor and acceptor electronic levels in semiconducting nanomaterials, thereby accessing band alignment at photovoltaic junctions and photoelectrode surfaces. Finally, the challenges and opportunities in the time‐dependent simulation of cyclic voltammograms, impedance spectra, and deep‐level transient spectra will be identified. These time‐dependent multiscale models, which will be developed in the widely used QUANTUM‐ESPRESSO distribution, would pave the way for comprehensive studies of kinetic processes inelectrochemical and photoelectrochemical systems in tandem with time‐resolved spectroscopy experiments. 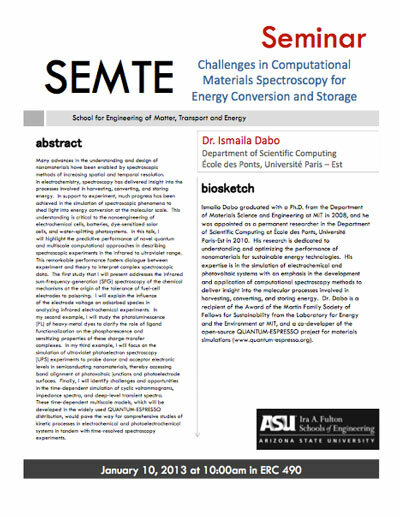 Ismaila Dabo graduated with a Ph.D. from the Department of Materials Science and Engineering at MIT in 2008, and he was appointed as a permanent researcher in the Department of Scientific Computing at École des Ponts, Université Paris‐Est in 2010. His research is dedicated to understanding and optimizing the performance of nanomaterials for sustainable energy technologies. 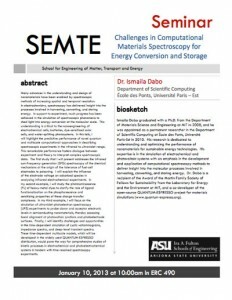 His expertise is in the simulation of electrochemical and photovoltaic systems with an emphasis in the development and application of computational spectroscopy methods to deliver insight into the molecular processes involved in harvesting, converting, and storing energy. 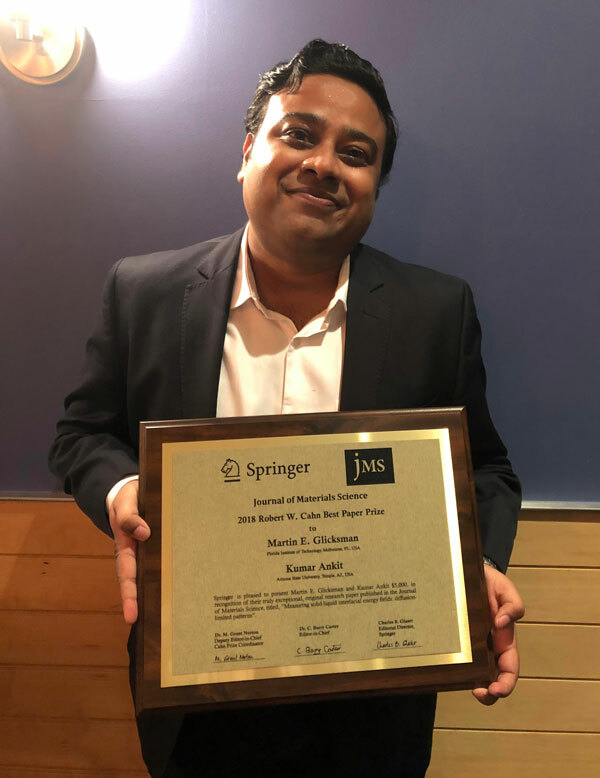 Dr. Dabo is a recipient of the Award of the Martin Family Society of Fellows for Sustainability from the Laboratory for Energy and the Environment at MIT and a co‐developer of the open‐source QUANTUM‐ESPRESSO project for materials simulations (www.quantum‐espresso.org).